Boko Haram militants have attacked three military bases in northeast Nigeria, putting the spotlight on insecurity in Nigeria just three months before presidential polls. On Sunday, militants attacked a base in Metele, a remote village in northeast Borno state, near the Niger border. Troops were “dislodged” from the base before it was reclaimed with aerial support, a military officer in the northeast told AFP. “There are still no details of human or material losses,” said the officer, who asked not to be identified because he was not authorized to speak on the incident. The same day, militants also launched a pre-dawn attack on another base in the town of Gajiram, some 80 kilometers north of the Borno state capital, Maiduguri. “Soldiers fought off the insurgents after hours of fighting which lasted up to 5:30 am (0430 GMT),” said Kulo Gana, who lives 60 kilometres away in the garrison town of Monguno. On Saturday, Boko Haram attacked a base in the town of Mainok, killing a soldier and seizing a truck from civilian militia fighting the militants. “They faced stiff resistance from soldiers who fought them for an hour before the terrorists withdrew,” said a militia member in the town. “We lost a soldier in that Mainok attack,” the military officer said. Boko Haram claimed Monday to have killed 42 troops in the Metele and Mainok attacks, according to the SITE Intelligence Group which monitors militant activities. The militant group said it killed “more than 40 Nigerian soldiers” in Metele and two more in Mainok, in addition to carting away “four tanks” and other vehicles and ammunition. Army spokesman Brigadier General Texas Chukwu told AFP he had “no information” about any attacks. Neither claim could be independently verified. Attacks on bases have increased in recent months and claims that the military has played down casualties. The military said it repelled an attack on a base in Kekeno village, near Monguno, on Friday, in the second attempted takeover in two months. 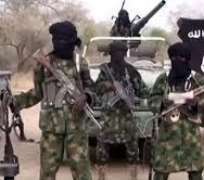 Boko Haram also claimed another attack on a base in Kareto, 150 kilometers north of Maiduguri, last Wednesday. More than 27,000 people are thought to have been killed in the nine-year militancy that has triggered a humanitarian crisis and left 1.8 million people without homes. President Muhammadu Buhari, a former army general who was elected in 2015 on a promise to defeat Boko Haram, is seeking re-election at polls in February. His government maintains that the militancy is close to defeat.